A University of Sydney astrophysicist whose research has the potential to revolutionise the way we view and understand the universe has attracted the interest of German researchers. 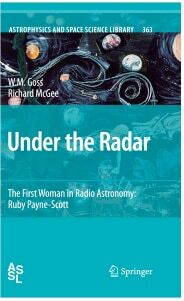 The official book launch of Under the Radar, the biography of Ruby Payne-Scott (1912-1981), graduate of the School of Physics and the world's first female radio astronomer. Professor Iver Cairns was recently interviewed by ABC Radio National on the Decadal Plan and the Federal Government's new Space Policy Unit. Adjunct Associate Professor Roger Fulton and his team have been awarded the Siemens High Performance Pre-clinical Image of the Year at the 2009 World Molecular Imaging Congress in Montreal. Juliana Kwan re-thinks how far could you travel in a spaceship travelling at nearly the speed of light. Join Dr Joe Khachan and learn about the Charge Exchange Thruster (CXT), a new type of electric propulsion system for spacecraft. Boris is a Senior Lecturer in optics and photonics within the Institute of Photonics and Optics (IPOS). Kuhlmey was recently awarded a Future Fellowship for his research into photonic crystal fibres. Neutron stars are almost the proverbial diamond in the sky. To date, less than 2 000 have been detected in our galaxy, which is filled with billions of 'normal' stars. When David Hsiao-Chuan Wang accepted the challenge of a University of Sydney scholarship proposal of 'using optics for dental health' he had no idea he would make a pioneering breakthrough in the area of painless analysis of tooth density. Channel 9 reports on CUDOS' breakthrough 640Gb/s technology which is at the forefront to increase the speed of the internet. The 'Frontiers of Science' exhibition features a science comic series that appeared in the Sydney Morning Herald from 1962 to 1987. One of the originators was Professor Stuart Butler, a theoretical physicist at the University of Sydney. Science Professor of the Month for the Canberra Science Calendar is Professor Marcela Bilek. It was a magic night when science and music met at Music and the Cosmos - an event to celebrate the International Year of Astronomy. The Sydney Science Forum and Sydney Conservatorium of Music presented the special event, featuring leading astronomers from the University of Sydney's School of Physics and the Sydney Conservatorium of Music Brass Ensemble. The Institute of Photonics and Optical Science (IPOS), the newest institute in the University of Sydney and the only one of its kind in Australia, was launched on 23 April 2009 with a one-day symposium 'The Photonic Universe - Faster, Further, Smarter'. Around the World in 80 Telescopes features the School's own MOST telescope.